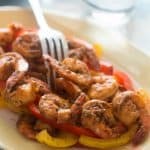 Sweet chili shrimp recipe – This sweet and spicy shrimp appetiser seasoned with paprika will literally blow your guests away with fingerlicking flavour. Did somebody say sweet chili shrimp? Oh yes indeed, it’s about to get hot in here, so hot your mind will blow away. Okay I’m exaggerating but you get the idea of what I mean. The clue is in the recipe name which is indicative to HEAT – that’s a favourite culinary style of cooking in the Caribbean. If it’s hot and fiery Island people instantly gravitate towards the recipe, in other words they immediately become intrigued. Although this is not a Caribbean recipe, I feel the level of heat is certainly on parity to the tropics. I know not everyone is a fan of hot food and that’s okay because there are so many ways to control the level of heat to suit your preference so please do not be deterred because the recipe denotes spiciness. Determine the level of heat needed – As part of this recipe I used a small amount of chilli flakes for heat. Let’s be clear on something here, the amount of chilli flakes used will determine how hot the recipe will be. If you want something extremely hot then up to 2 teaspoon, however a 1/4 – 1/2 teaspoon will give the recipe a slight kick. Being a Island girl I like a bit of spice in my life but not too much, so no more than 1 teaspoon worth of chilli flakes. 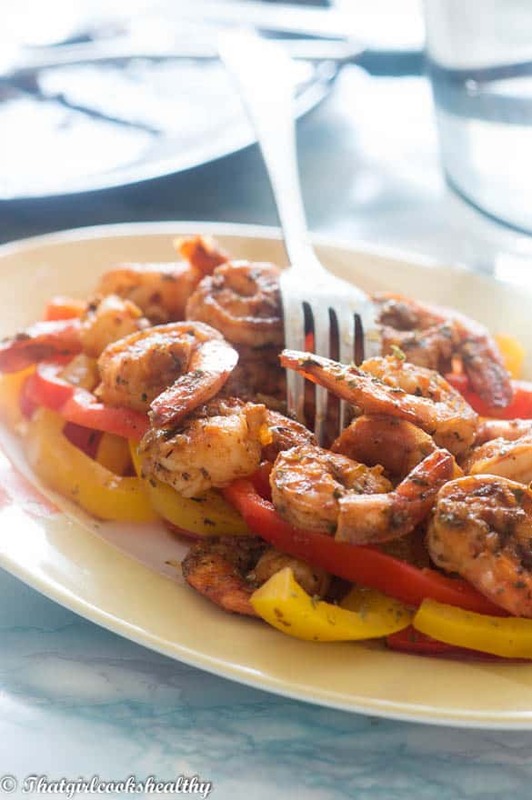 Applying the rub – You don’t need to prepare the rub on the shrimp overnight, instead you can do the prep work as you go along and simply toss the seasoned shrimp into the pan. I usually make this recipe on a wimp, for some reason I find this to be a spur of the moment recipe that’s seemingly a hit at least according to my loved ones. vegetables or even some root starch vegetable such as cassava, breadfruit or even sweet potato to make it more filling. Place the devained shrimp in a medium sized bowl and add all of the ingredients excluding the coconut nectar (or sweetener) and water. Use your hands to rub the ingredients into the shrimp. Mix the water and sweetener together and set aside. Add the shrimp to the pan and proceed to cook. After 1 minute pour the watery mixture into the pan then stir and rotate. Cover with lid and steam for 4-5 minutes. 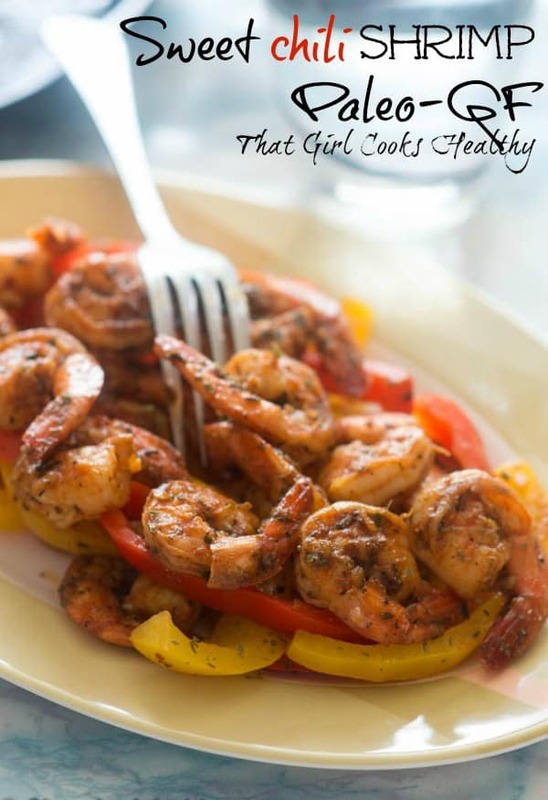 I love spicy shrimp recipes and this one looks so good! How many chili flakes did you use? I’m not sure where that is in the recipe. Thanks! Thank you. So sorry I used 1/4 tsp of chilli flakes I shall amend the recipe accordingly. LOVE everything about this and your photos are absolutely mouth-watering! Spicy is as spicy does. I like things milder, some of my family like things lots hotter. I think we’ll be making shrimp in two batches lol. HAHA ….the great spiciness debate I love it, sounds like my family too. Make it however you see fit, you will LOVE it. This looks absolutely fabulous. 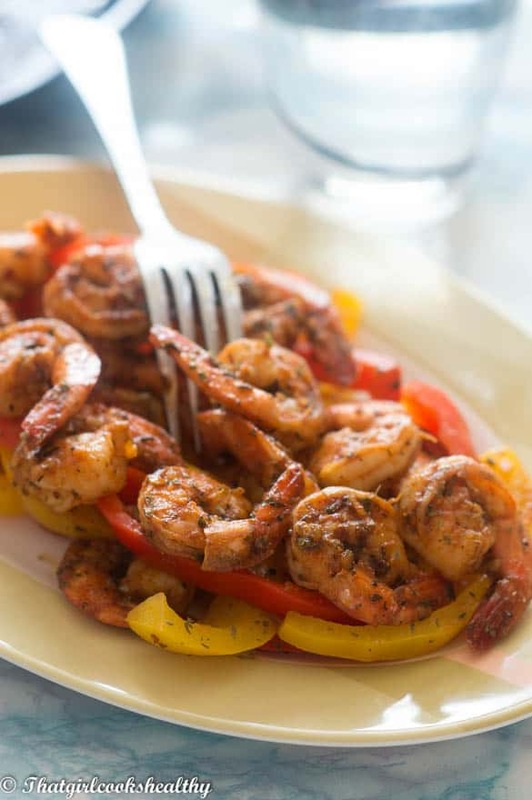 Nothing beats a spicy shrimp recipe. Looks so amazing and I’m jealous that you are an island girl! I can tell you from my times in Hawaii and in the Caribbean, I love the fresh seafood. It’s ridiculously amazing and fresh! What a fantastic dish to make so super fresh! Great job on this one! Thank you Amanda. 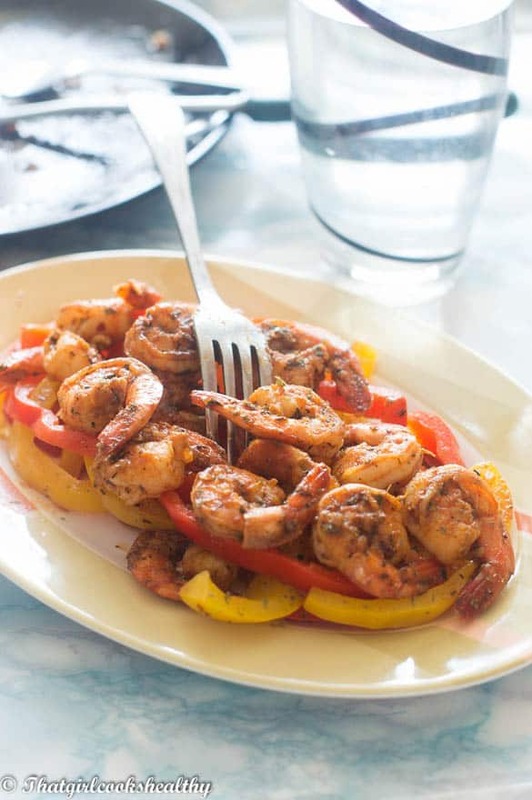 Yes nothing beats using raw shrimp to make a good seafood dish. well! thanks Charlene for nice recipes. It looks so good. Just want to be an island girl like you! Aww, you are more than welcome and thank you for such a wonderful comment.